A Moped Bill of Sale allows the exchange and transfer from one party to another for monetary funds and/or trade. 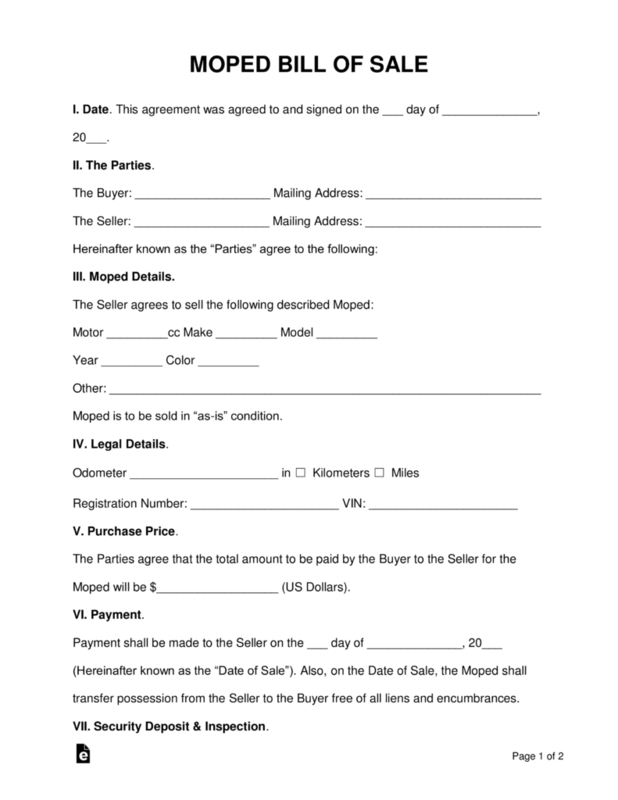 The buyer and seller should meet to execute the agreement at the time of sale or, if the moped is to be inspected, a deposit should be provided with an agreed date of sale to occur at a later date. It should be known to the buyer that the moped will be sold in “as-is” condition and any defects, repairs, or maintenance found, after the sale, will no longer be the liability of the seller. When is a Moped Bill of Sale Needed? The Moped Bill of Sale is required in the purchase or sale of a moped between a seller and a buyer. 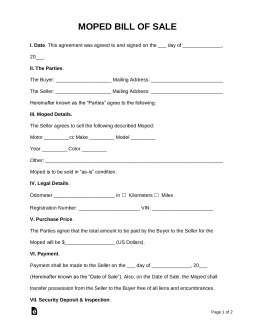 This form acts as a receipt, proof of ownership and protects the seller from any liability of repairs, damage or defects found after the sale. This form is also crucial in getting your moped registered with the DMV. They will need proof of ownership and the Moped Bill of Sale often qualifies as such. Now with that knowledge in hand, it’s time to talk about the process of selling your moped. Follow our step-by-step guide below to get started. To get the best price for your scooter, you might want to invest in cleaning it up and making sure all its parts work. Take good, well-lit photos of your old ride and post them around town and online. Try to spread your net to attract the most potential buyers by mixing different advertising methods. And don’t forget to pass the word around to friends and family too. Just because a moped doesn’t require a driver’s license doesn’t mean it doesn’t need to be registered. So make sure to locate the title, pay any dues you still owe, and prepare it to be transferred once the sale moves forward. Buyers aren’t going to want to buy unless they can see the scooter in person. So let them! This will help ensure they feel confident that you aren’t hiding anything and can be trusted. Just make sure to take something of theirs in return for letting them test ride it. You don’t want the buyer to run off with your moped. As extra insurance, you may want to have the Moped Bill of Sale notarized by a public notary. This will keep a public record of the transaction in case of complicated disputes that may come later.